Your friendly and knowledgeable personal tour guide will be for you at the lobby, the entrance of your hotel or your cruise ship terminal. 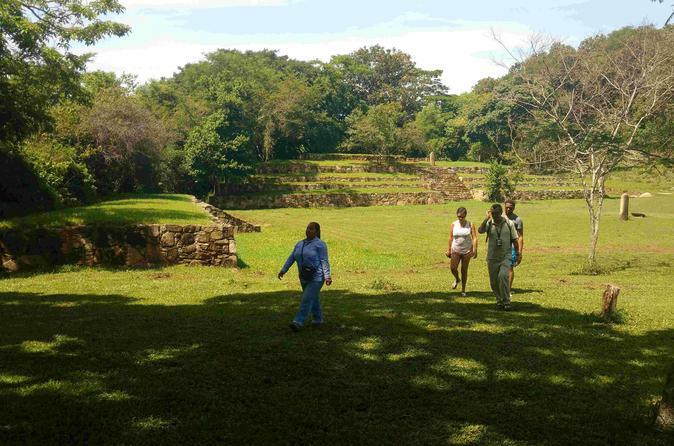 Once on board your tour will head to the most important archaeological zone in the State of Guerrero. Only one hour away from Acapulco, Tehuacalco will along of the hand of your tour guide is awaiting for you to unveil every one of its secrets. After a visit that will not take less than 2 and a half hours the excursion will head back to Acapulco to enjoy a delicious typical Mexican Lunch with one drink. About an hour after leaving Acapulco, Mexico’s number one resort, your van will park in front of the Museum of the Tehuacalco Archaeological Zone – only recently opened to visitors. Always in company of your personal tour guide visit thoroughly Tehuacalco and learn all there is to know about this fabulous site. Tehuacalco peaked between 650 and 1100 A.D. as the ceremonial center of the Yope and their surrounding region. It existed for more than two more centuries albeit in a declining cycle. Long lost to the South Sierra Madre Mountains of southern Mexico this pre-Columbian archaeological zone is the most recent addition to the cultural attractions offered to visitors in Acapulco. Tehuacalco´s location between four prominent hills, marking the four cardinal points, was important in the lives of the Yope. The site has been identified by historical sources as Yopitzingo and is the first explored and excavated archaeological site of the ancient Yope civilization. Tehuacalco remained independent of the Aztecs because of its remote location and the difficulty to access the area. As well, the Yopes had a reputation as being fierce warriors. During the excavations archaeologists learned that the Aztecs never managed to conquer the city either due to the peoples’ warrior reputation or because the Yope territory had little to offer the Aztec Empire.